These two views span about 100 years. This view is from about 1905. The IRT Kiosk was new in 1904/5. An interesting fact about the views is that the el structure was built in 1887 with two tracks and the station was a single-island platform, as seen in this view. This later photo is from about 1955 or so, as the trolleys disappeared in 1950, and the trolley tracks are paved over in this view. The IRT Kiosk disappeared some time after 1955 also. The el station was reconfigured, or reverted back to a two-track, single-island platform after 1955 when it became the end of the line and the center express track was removed and the trackway planked over. The el was rebuilt to three tracks in 1916-18 and this photo shows the three-track, two-island platform format. This is a picture of my mother and sister Lisa at the Bronx Beach & Pool. I would say it's about 1959 when this picture was taken. I remember going through the warm shower they had before jumping in the pool so you wouldn't be cold. Editor's Note: An exterior shot of Bronx Beach & Pool may be found on Page 11 of the gallery. That cold shower Kim speaks of was actually intended to wash sand off patrons before they entered the pool. This is a photo (taken in 1961) of my dad Louis, older sister Lisa and me at Ferry Point Park with the Whitestone Bridge in the background. We would go almost every weekend in the summer with grandma, grandpa, aunts, uncles and cousins. The walk from the parking lot to the top of the hill near the bathroom house was always so long when I was young. We would barbecue and fish for flounder all day long. This is where my father gave me my first fishing lesson. I still remember putting that sandworm on the hook for the first time! Yuck! 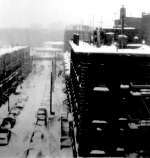 This is a photo taken in February of 1959 from the roof of 845 Walton Avenue, looking toward the northwest. It shows the block extending along the north side of 161st Street from Gerard Avenue to River Avenue. Visible in the photo, starting from the left, are Nedicks (at the corner of River Ave.), the Stadium Deli (around the middle of the block), Addie Vallins and the Roxy Restaurant (by the corner of Gerard Ave.). Across Gerard Avenue from the Roxy, a part of Vine's Men's Shop is visible. Across 161st Street from the Roxy is the Yankee Tavern. The Woodlawn-Jerome elevated train runs across the picture, and the spur that used to run to the Polo Grounds is also visible. Brook Avenue in 1955. Brook Avenue and Hegney Place run diagonally together at this point because there is a train line underneath. This is one block east of Third Avenue between East 157th and 158th Streets. The Third Avenue El's station was at 156th Street. Taken in 1940, this picture shows 50 West Tremont Avenue, between Davidson and Lower Grand Avenues and down the block from University Hospital and across the street from a 24-hour Chinese laundry service. Also at the end of the block, next to the hospital, is Snake Hill. Across from Snake Hill is Harrow's Lumber which, the last time I visited, was still there. This photo was taken in 1950 from the fifth floor fire escape of 1212 Seneca Avenue in Hunt's Point. You are looking north along Irvine Street. On the ground floor of the building at the right-front was Nathan's grocery store. This is the corner of Eastchester and Gun Hill Roads where they were redoing the park built in 1960. In the background is the old Holy Rosary Church. The post office on Gun Hill Road had not yet been built. This is Saint Raymond's church, located on East Tremont Avenue, with Castle Hill Avenue to the left. The picture was taken during renovations which I think took place in the late 50s or early 60s. The tower, still intact, is one of the older towers which were replaced because they had become unsafe. The newer design which replaced these was supposed to be more in keeping with the rest of the architecture. Notice East Tremont still had the cobblestone pavement and under the traffic island are the old trolley tracks. The school and Parkchester apartments can be seen to the right.